Pencils are a nigh-indispensable tool for the artist. But usually, especially with ink work, they need to be erased, and that can be a hassle. It’s a lot of work, it risks ruining the drawing (or paper), it takes time, and it becomes harder to correct later. But oftentimes the final work is either a duplicate of the original, or more work is done over inked lines, meaning that using a pencil that simply doesn’t show up in the reproductions saves time and work by not needing to be erased. Non-photo blue pencils were used for this purpose as many image replication processes (mainly cameras and photocopiers that were used to duplicate artwork for printers) have a hard time transferring it, and they still retain a place with modern scanners that will be able to pick the color up, but do so in a way that the image can be easily edited to omit it. 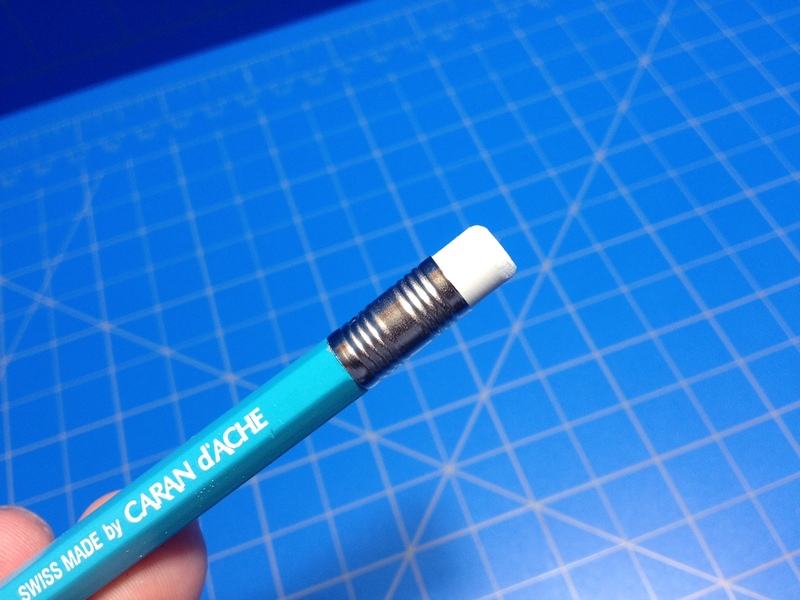 But is it really worth it to get a new different pencil like the Sketcher from Caran d’Ache? The pencil is as basic as one can get: made of wood and hexagonally faceted to limit rolling, one end is sharpened the other has a metal ferrule connecting the body to an eraser. The body is a pleasant blue color mirroring the color of the lead and on one facet neatly stamped and inked in white is all of the relevant information. 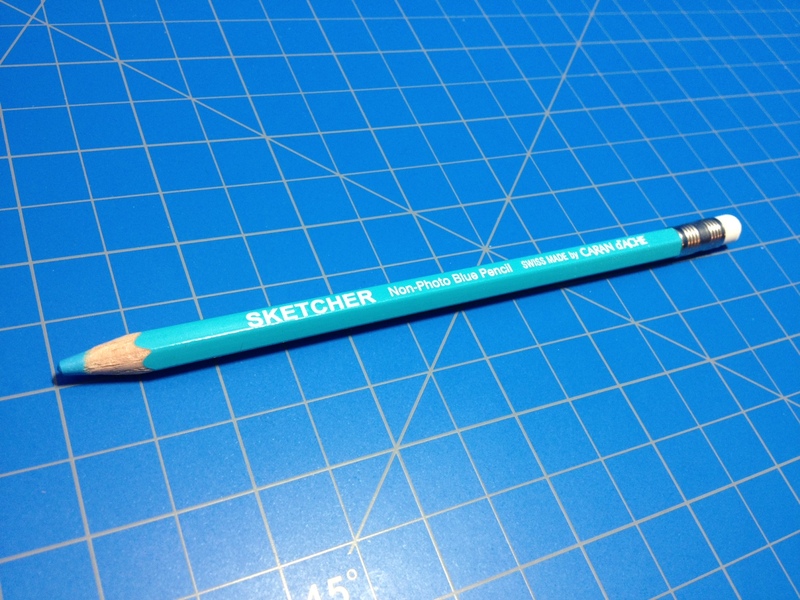 It looks and feels very much like a standard #2 pencil. 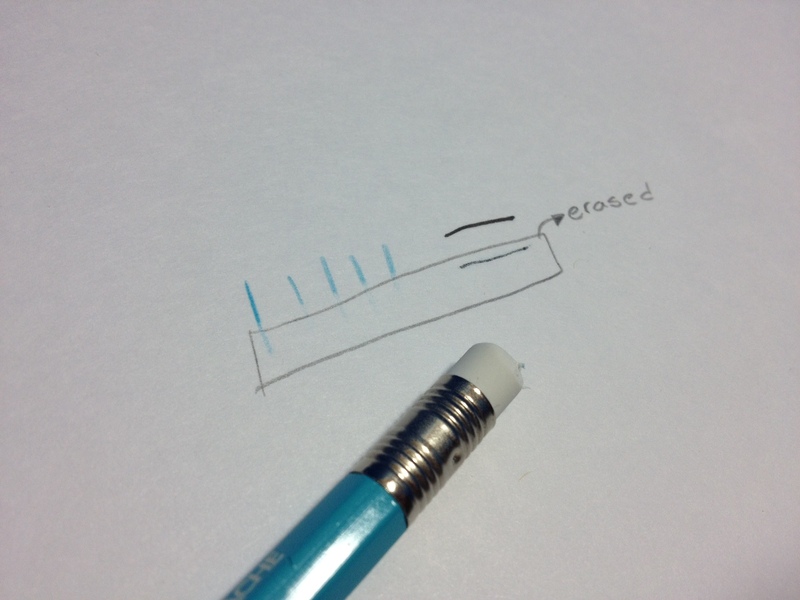 The eraser is well done; it erases cleanly and is dense enough to not float away far faster than the rest of the pencil. The lead is hard to place in hardness; it feels softer than a standard HB but it has a more waxy quality (characteristic of colored pencils) that makes it give a much harder line. So it writes somewhere harder than HB and wears somewhere below. The line it produces can go from very light to surprisingly dark, but even at its most dark, it is barely visible in scans and can be easily isolated and removed. But it is only a tool for pure ink drawings, and its use is limited in other senses. If one were to, for instance, lay a wash over it, it would be harder to isolate and almost impossible to be rid of on scans, and it resists being covered by lighter washes. And if one were to erase before laying down a wash they would find that the ink laid on top of the pencil is cut down severely, with the entire line becoming grey and having several holes that are almost white, basically where the ink adhered to the pencil and not the paper (this effect is present, but much less severe, with standard graphite pencils). A similar set of problems would be encountered by someone wishing to put color down. 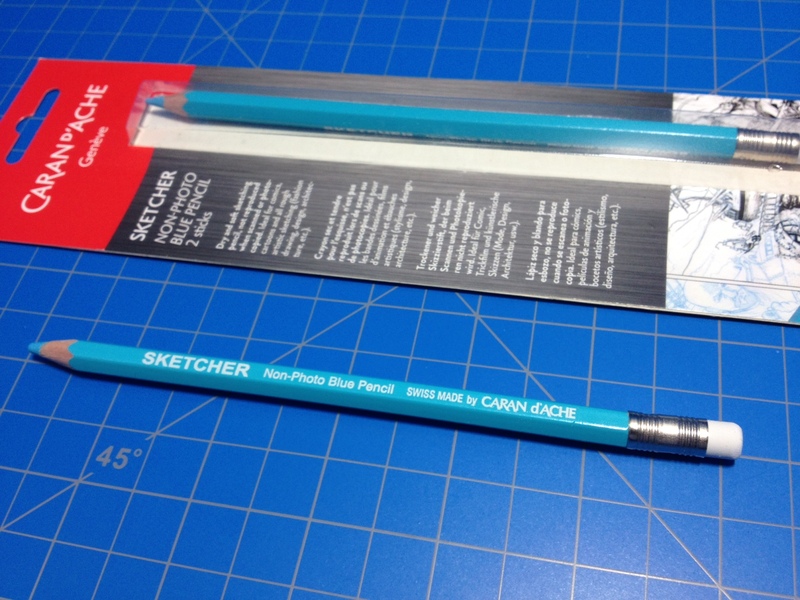 So using a pencil like this would necessitate an additional step between inking and coloring/washing where the inked drawing is reproduced and tweaked to eliminate the blue (and potentially other errors). I’ve also had a bit of an issue with the lead being soft enough to break inside the pencil. It hasn’t been severe, but it’s worth noting. 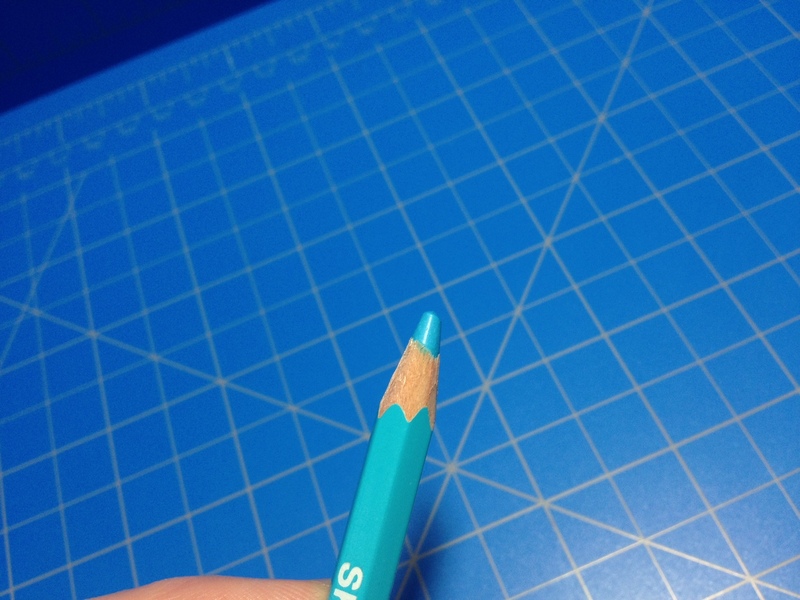 So am I converted to the blue pencil? Not quite. I really like it, and for a specific type of work-flow it is perfect, but that work-flow isn’t mine. I color/wash my original drawings, and I don’t see that stopping unless I get big enough that I can hand it off to someone else. So the pencil has very little use inside my work environment. I do use it now and again, but it also wears down quite quickly, and having to use a sharpener just drives me back to my mechanical pencils. 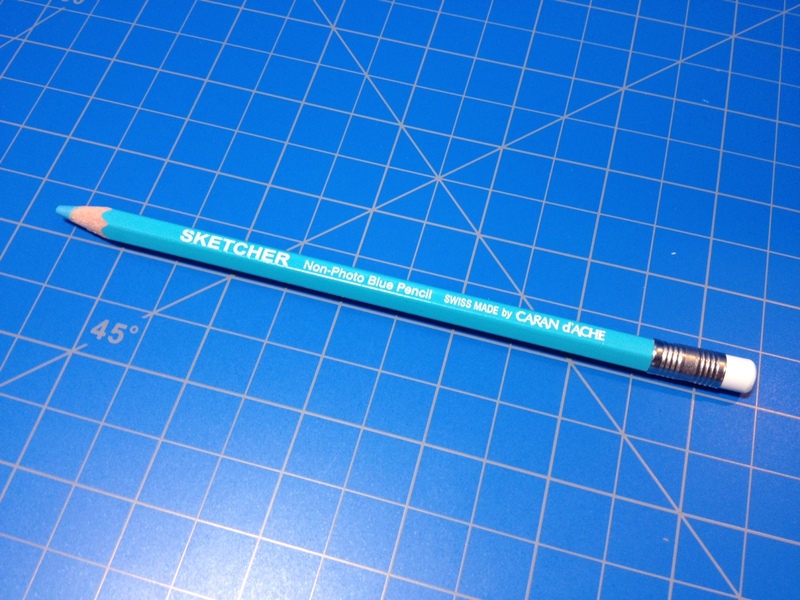 That being said, it is a well-made pencil that does its intended job superbly. If you need to reproduce or scan in original inked artwork and don’t want the hassle of erasing, I would say this is right up your alley. This entry was posted in Intermediate Supplies, Utensils and tagged art supplies, art supply, art supply critic, caran d'ache, cartoons, color, colored pencil, comic books, comics, eraser, image reproduction, ink drawings, light blue, non photo blue pencil, pencil non photo blue, photocopy, reproduction, review, scan, sketcher, sketching, sky blue, soft by Dragon Co (Austin Smith). Bookmark the permalink.